Beautiful winter weather lately! It's warm (in the 20s and 30s = warm after single digits and below zero windchills) and great for sledding and snow fort building. Getting all the White Hawk children dressed and outside at the same time, now that's another challenge. Hasn't been accomplished yet! 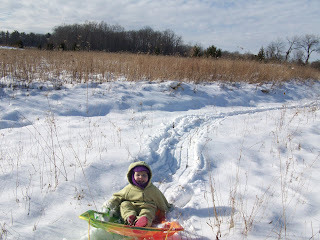 Sue (above) loves riding in the sled, even over the bumpiest and weediest terrain. Thank you to the deer for making trails for us.